The idea of creating your own website or online brand is a daunting task. You have to own specific web design skills, know how to operate and maintain an IP address, and be able to upgrade with the fluctuating market. It is simply a task that most will not be willing to take on. This is where Shopify comes to the light. Shopify is an eCommerce site that helps small businesses or individual entrepreneurs get their products and business to a global market. They do all of the hard work for you, like maintaining a web space, providing SEO and marketing tools, and ensuring that your offerings are seen by a large audience. The various selling platforms suit any individual, leaving you in your comfort zone. They also provide walk through demonstrations that detail how to set certain themes for your web space or provide the measures needed to optimize in quick fashion. Below we'll dive into the site and give a detailed look at how everything works. 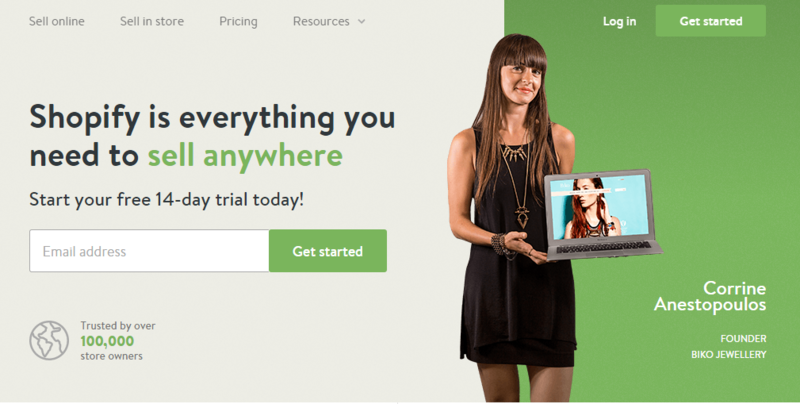 Shopify offers a free 14-day trial period for individuals curious about the workings of this company. This is a safe place to start for individuals looking to gain a strong knowledge base of how to create and sell with Shopify. This free trail gives the user access to most of the tools that Shopify offers, but can be limited when it comes to advanced design features, tutorials, and other such proprietary tools. This is a good starting point for individuals looking to start at Shopify, as it provides the perspective user with a chance to get a feel for the processes and steps taken to ensure eCommerce success. Shopify does a great job in creating a user-friendly interface. It frees the user from having to apply coding and programming knowledge by providing the necessary functions and domains through their service. Their services are fully detailed through how-to videos. These step-by-step productions help the user understand anything from international shipping to taxation upon goods and services. These tools work best for individuals looking to develop an online store space. These services work with sellers to provide them with a space that sees both traffic and a wide range of individuals. Certain third party applications can be used in coherence with Shopify, allowing users to reach the global market place. They take the technicality measures out of the discussion, allowing the user to focus on their business development and marketing their brand. A big portion of the intrigue Shopify holds comes with their varying web design models and website templates. The user can host a one-stop-shop store, focusing directly on product sales instead of creating a knowledge base. Some products carry a knowledge curve in order to sell and Shopify creates the tools necessary for accomplishing this task. The templates available at Shopify span a range in the 100s, leaving plenty of options for the consumer. These templates feature free usage or may require a fee. This one-time fee usually reaches the $100 range, but the benefits that can come from this small investment can lead to increased production and sales over time. All of these templates are tiered out to show the duality of usage across your site. You can view example sites that feature the same template, allowing you to picture your production before it launches. The template space also offers some customization or advantages for sellers. If you host web template design skills, you can use Shopify's editing tools to create and design your own template. This structure allows users to add elements and images to their particular web page. While it is a personal touch measure, it often requires a little web design experience to attain. The second method is through buying from individuals selling their templates. Shopify offers a space where individual creators can upload their template designs and features and sell them through the site. This benefits both the buyer and the seller because it offers a personal contact base and provides users with the option to contact the creator to learn about the design and features of said templates. The best part about the Shopify software is that it can be used on multiple platforms. Included templates and designs will carry over to a mobile platform, allowing access from any location. Most mobile applications will limit the carried features, leaving your customers in a bind. Shopify helps to add mobile selling features, such as simplified checkout or one-click purchasing measures. These inclusions help Shopify stand out from other selling hosts and puts the seller ahead of the mobile curve in reaching customers on all four corners of the globe. One hindrance of reaching a global market is the transfer of currency and estimated values. This can be a pain for individuals selling products and services that span a global horizon. With Shopify, this step is completely simplified for the user. The interface allows simple conversion rates and ensures that you can be reached by all users. This is furthered with the development of simplified shopping. This technique can be applied to large volume buyers or repeat buyers. It helps ease the buying process for the consumer and eases the pressure on the seller by providing simplified conversion methods and quick payment acceptance. Shopify hosts over 50 different payment methods, allowing almost any form of payment to switch hands. This allows users to use any payment form, ranging from major debit and credit cards to bank wire transfer. Shopify hosts the largest number of different payment gateways across the ecommerce space, creating an acceptance rate that blows the competition out of the water. Shopify offers two different variations of sales methods: selling online and selling in person. The online space carries many different channels for the user to choose from. These channels act as flags that bring in a large audience to your website from different locations across the web. It also benefits the seller by creating a tracking process that stores additional information. Seller stats, history of purchase location, and other such mechanisms allow the seller to observe market trends and spaces that benefit their sales. Tracking this information can lead to additional breakthroughs and help the seller gain knowledge about the market. The different set of channels spans in range, covering anything from Pinterest to Facebook. The seller can link their sales model to these accounts, increasing both viewability and marketing range. The Shopify online store provides the seller with their own domain address, which can be shared across these platforms with a simple click or copy and paste method. The sharing of your domain is also handled by Shopify, providing simple conversion methods to promoting your online store. Pinterest features buyable pins, which can be attached to your products if they have been pinned previously on that website. This brings the user directly to your domain and builds a simple and quick check out measure. Your store can also host a Facebook location. Your Facebook store carries over interface and design measures to ensure standing in this additional platform. Shopify also holds a comprehensive messaging service. This messenger allows users to interact with sellers directly, buying via conversation. It also allows users to ask questions about shipping services and other such time tables. It provides a great interaction tool and allows the seller to get the most out of their buyers in terms of information, recommendations, and approvals. Yet another comprehensive feature is the use of the Shopify buy button. This button can be applied directly to your own individual website, even locations that expand beyond the Shopify range. Simply place this feature within your webpage to bring your users directly to your Shopify web space or express checkout. The last channel of specification is through a partnership with Amazon. Shopify works with Amazon to provide their sellers with a one stop shop location. This creates an ease in the inventory process and allows users to hold their items in one location. These different methods help span an environment that hosts the most variations across the online selling space. The second selling feature Shopify offers is through the use of their POS system. This system applies a chip reader that can be directly accessed with tablet, iPhone, iPad, and other Android platforms. It creates a checkout in any location you are to host your products. Like other POS devices, Shopify's system offers additional measures to ensure customer satisfaction with this in-person method. Sellers can add additional products onto a purchase, create invoices, update shipping locations, and other such add-ons. These measures help create a sales feature one would find in most major retailers. This method brings many additional offerings to the consumer, but some are left off the table. The user should check with Shopify's POS rules and regulations to ensure the desired selling platform and features are hosted by this service offering before enrolling. One of the largest concerns sellers have when exploring the online selling space is the implementation of taxes on their products. Taxation differs across locations and by products, so it can often be a hassle to calculate. Shopify provides users with built-in taxation systems to ensure that they are charging the necessary rates and amounts. This helps the seller gain accuracy in their yearly reporting and helps maintain their business as a verified contender in the market. It is important to note before discussing the taxation systems, Shopify does not file your sales taxes for you. You must locate and file your taxes via the federal regulation agency governing your area of operation. Shopify does provide regulated taxation measures that are consistently updated and reported, providing users with the accurate charging rates at all times. The different selling spaces have separate uses for these features. For individuals selling via the online store, you need to set your taxes to match the location that you are shipping to. For example, if you are shipping a package to Japan, you would set your taxes to that of Japan for that purchase. This feature spans all of the locations that you ship to, allowing you to find locate areas that may benefit your sales targets. If you are utilizing the in-store selling option with Shopify's POS feature, you want to set you taxes based on the locations of their retail outlets. If you are wishing to host a digital sale, you will need to set up that taxation system. All of these numbers are set and modified by Shopify. If you feel the need to override any tax rates, you are free to do so. One of the greatest tools a seller possesses is statistics related to customer acquisition, point of purchase, and other such analytical data. This data is very valuable to the user because it allows them to track trends, modify their services, or target different areas of the market. Shopify offers a few different analytical tools that the user can host, leaving endless possibilities for growing and establishing long-term business. One of these tools is tracking via the Facebook Pixel application. This application was designed to be carried with your Facebook selling space. Through this app, the user can track customer acquisition costs, promotion effectiveness measures, and other such intrigues. This application sends the user reports at their own discretion, which can provide timely data for those who host products that require a quick turnaround. The use of this application requires some understanding of the Facebook Ad Manager programming. You will also need to own a Facebook account for you to use this coding on your Shopify website. If you have these two pieces handled, it will create an ease of access for the user and provides timely data. Shopify also offers customer reports through their different levels of servicing. The type of Shopify account directly relates to the number of additional features you will be afforded. The most basic account, which is set at $9 per month, affords the user weekly to monthly financing reports. These reports include data related to taxes, received payments, and other such basic data. It also allows the user access to an online store dashboard. This dashboard adds additional reports and graphs that the user can access for their own usages. While this subscription and data set is rather basic, the data provided will showcase the user of locations where the product is frequently bought and will directly relate to marketing techniques moving forward. The more advanced accounts that Shopify hosts allow for a greater range of features. These features include: sales reports, customer reports, acquisition reports, behavior reports, and other custom reports. The sales reports are important because it allows you to know if your product will hold longevity. If you host a seasonal product, you can find that direct relation between time of the year and sales data. Customer reports allow you to locate certain trends within the market. They detail return customers and other such beneficial information to the user. Acquisition reports are one of the most important data sets a seller can have. Relating customer acquisition cost directly to the sales price and other such numbers can help price your goods and increase sales over time. Behavior reports details trends on a more in-depth basis. They discuss when people are buying the products and give intel as to why. Custom reports can be set by the seller, which bring greater data sets to analyze for a benefit. As mentioned previously, Shopify hosts multiple different account formats. The most basic being Shopify Lite. This service is offered at $9 per month and contains some additional intrigue features. The Shopify Lite member has access to the Shopify buy button, Facebook selling, POS systemization, and fraud analysis measures. The user is also afforded one staff account manager. These managers help answer daunting questions and can assist with some integration measures. The second option is the Basic Shopify account. This service is available for $29 per month. It holds the same features that the Lite account does and provides additional features for usage. Some of these additional benefits include: 24/7 staff support, an SSL certificate, and two individual account managers. The 24/7 support staff allows the user access to answers whenever they need. This support can be reached via e-mail, phone call, or live chat any time the user may need. This account also hosts the benefit of applying an SSL certificate to your website. These certificates are optimal for security measures and they ensure that your site becomes highly regulated. The two-account manager offering is a step up from the Lite account, as it provides an additional source of opinions, support, and servicing. The third account formatted by Shopify is the Shopify account. Made available at $79 per month, this account hosts all of the previous offerings plus some additional items. One important factor is that this account carries rates of 2.6% + $0.30 on credit and debit purchases. The previous accounts have rates of 2.9% + $0.30 on credit purchases. This will help increase your margins over time and directly benefits the seller hosting a large volume of monthly sales. The user gains the access to an actual online store via this feature. This releases access to the user to edit, design, and modify their website. The previous methods only allow for certain levels of modification. The user can administer gift cards via this option, allowing them to grow their brand. This option also brings professional reports to the users. These reports are related directly to the customer, their buying trends, acquisition data, and other such in-depth analyses. The last option is the Advanced Shopify account. With the price set at $299 per month, this account is recommended for individuals that host a large number of monthly sales. This format benefits the larger business based off of monthly cost alone. The credit card rate for individuals using this platform comes in at 2.4% + $0.30. It hosts the same features the other accounts hold and provides some intriguing additions. The users hosting these accounts will gain access to an advanced report builder. This will allow the user to compare statistics with ease. They also receive access to 15 different account managers. These individuals are made readily available and can combine their thoughts to help boost your business to new heights. As you can see, there are many different forces at work at Shopify. The tools they provide keep the user on their toes and with plenty of information to analyze or document for future use. The different formats of account allow for any user to utilize the service, no matter the size of the hosted business. The implementation of different formatting tools benefit both sellers and buyers alike by featuring additional offerings from user created templates. The simple to understand taxation tools allow a user to receive accurate representations and never be limited to selling to a certain market or location. The support staff has hosted many years of servicing, which means they are able to provide ample help if challenged with some of the most difficult situations. The usage videos and walk through modules help the user bypass the learning curve with ease. The process carried out by Shopify is truly revolutionizing the eCommerce world. They are creating the necessary measures for small and big businesses alike to get their feet wet in selling online. They provide the elements needed to grow and sustain a share of the current marketplace. The site continues to grow and add new customers on a daily basis. Their service technicians continuously monitor and control their offerings, ensuring stability at all times. They continue to bring new software elements to the table and will continue to help businesses create their very own stores for years to come.